Safaa Al-Saadi was born in Baghdad in 1973 and played music from a young age. 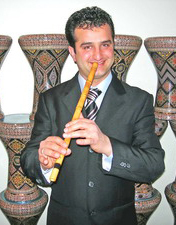 He studied for many years at the Music Institute of Baghdad and graduated from the University of Baghdad, playing many different instruments like the darabuka, khisbah, kabourine, raqq and the ney (arabic flute). In Iraq he performed extensively with various artists and groups and participated in festivals like the Babylon Festival. After a move to Norway in 2002 Safaa completed a year of studies at the Norwegian Academy of Music, graduating in the summer of 2007. Since coming to Norway Safaa has collaborated with artists like Miriam Segal, Helene Skaug and Sofie Iris, including performances at God Morgen Norge and Dansefeber. Safaa is also a composer and composed music in Norway for the movie “What can I say”, produced by Magid Gabir. This movie participated on the Filmfestival 2005 in The Hague, The Netherlands. After that the film has been presented in Rotterdam, The Netherlands and in Oterghitt, Masteghittm and Helfersom, Norway. Safaa has been giving workshops in several european countries about how to play instruments like the flute (the Nay) and different drums such as the Darabuka, Khisbah, Tabourine or the Raqq. He was accompanied by the musician and workshop teacher of the Music Institute Amsterdam Sattar Al–Saadi and the singer Said Ali Al-Gaddah. Invited in December 2004 by the director of the Internationale Center of Bodø, Norway, Safaa gave a concert at the International Week of Bodø. This concert was played together with several artists like Miriam Segal, Shakir Zowaid, Aziz Kaisar, Danial Showan and Hassan Al-Rassam. Safaa has been a member of Ellayali since 2008.